Taylor’s Bell Foundry has probably cast more large bells than any other Foundry in the history of bell founding – unlike other founders we have never farmed out our casting to other foundries, and all the large bells with the Taylor name on them have been cast here. More than 200 bells weighing between 2 tons and 17 tons have been cast at Loughborough, and we are now pleased to announce that an order has been received to cast a large bell for Canberra, Australia. 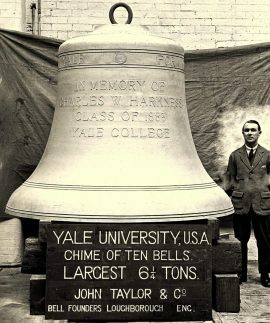 The cast weight will be approximately 6.5 tons, but tuning will reduce the finished bell to be in excess of 5 tons. The casting of this bell will provide a rare opportunity to bring one of our large wall furnaces out of mothballs, thus maintaining our capacity to cast even larger bells should orders come!